First volume, because I just feel like this is going to be an ongoing thing. These are not particularly revelatory or earth-shattering. Just small differences I’ve noticed as we make our way around. -In addition to yellow lights between green and red, there are also yellow lights between red and green. So you’re warned before you may go, and everyone just guns it during the pre-green yellow lights. Stay in there and think about what you’ve done, refrigerator. -British people really hate refrigerators. We saw all manner of crimes against the friendly little chillboxes while flat-hunting: tiny refrigerators, refrigerators crammed beneath countertops and refrigerators in living rooms for no discernible reason. 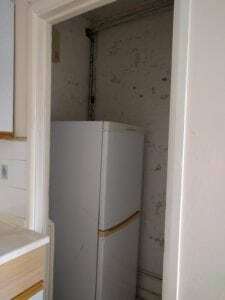 The worst, however, was the house that had an apparently normal kitchen except there was a tiny, cave-like closet off to the side where the poor refrigerator was forced to live. We couldn’t help but wonder what the fridge had done, to be forced to live its days in a bizarre, dreary kitchen dungeon. -When I was pregnant with Dexter, I read a lot of women complaining about unsolicited touches to their bellies but never experienced it myself. Friends who wanted to feel asked and everyone else kept their distance. I think this used to be a thing, but thanks to the internet and social media, most people have gotten the message that it’s not really appropriate. I also think, in America, most people have absorbed the same message about touching babies – ask first or hands off. British people haven’t gotten that memo. It’s just head pats and shoulder squeezes, and it doesn’t bother me. Just an observation. 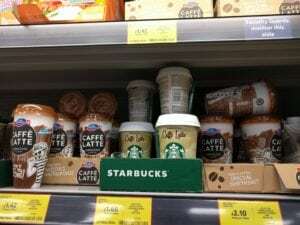 -You can buy adorable little “to go” lattes in grocery and convenience stores. -Drivers are super-respectful of pedestrians. I think this is a natural result when communities are walk-friendly and have good public transportation.